Farrakhan, who in recent months has made numerous anti-Semitic comments, made his call for a nation-state separate from white America in response to the question whether it’s still his and the group’s goal. “Let me tell you what’s gonna happen. Yes I’m after a separate state. A separate nation. In the 60s what was our cry? We weren’t saying we want to integrate, we were saying ‘It’s nation time!’” he said. This is an excerpt. Read more at Fox News. Wonderful idea…for ALL tints/colors/hues/pigmentations who have determined to coalesce with mongrel, racist-driven ideologies. Revoke the citizenship of those who depart….with the understanding that there will be NO returning, NO Foreign Aid (due to their propensity for their riotous violence and spewing of hate-filled methodologies, and certainly NO! to their oft-sought but undue ‘reparations’. And please….take the socialist-driven Democrats (and all others) who have declared war against the unborn removing from our midst their baby-killing mentality with you! One other thing: Make haste,…many of us will even help you pack! I say let them have a tropical paradise…Bikini Atoll. Am I the only one who thinks he sounds like a young Robert Bird? Could it be Farrakahn is presenting the same reasoning as the despicable kkk? Truly it is the content of one’s character and not the color of their skin that reveals the evil of their hearts. Well drill. Farrakahan is of the same PARTY that formed the KKK..
Nation of Islam is pretty much the black version of the KKK. Every bit as racist, if not more. And him being a Muslim, I can tell you what his “god” wants. To steal, kill, and destroy. And then resume the tests. Based on my seventy years of life experiences and observations of the races and my study of all the “holy books”, especially the Bible, none of you (white, black, yellow, red, conservative, liberal or independent) have the faintest idea of what God wants. HE’s gonna let all of you know shortly. You can take that to the bank. Lloyd M.
I a few words enlighten me. Those of us who read the Bible or the Torah know. I don’t imagine you can be included in that group. You’re free to believe however you want, in any case. As are we. I agree. Let Farrakhan and the rest of the scum who follow him get the hell out. I’m good with it. Best to have them all in one place. Makes it easy. And the USA already PAID for said ‘country’. LIBERIA..
Sure thing, Louie! It’s called, Liberia, and is located on the western edge of the continent of Africa. I would be perfectly fine with the government providing a one-way ticket to any and all Black Americans who wish to immigrate there. And all real Americans who love this country can stay here and be prosperous according to their merit. LOL. Bringing up the phrase “according to merit” to liberals, makes their heads spin! I do not care what color. How about all the liberal elites too! It’s blatantly obvious WHO needed for Dr. Martin Luther King to die. It’s wasn’t white people, it was the race baiters and the globalists. They would not survive under Dr. King’s peaceful narrative, they NEEDED anger, hatred, and division. Same globalists needed Kennedy dead. He was getting ready to expose them. Great, I am all for it. They can have California. Ah, no. We already have enough trash here, we don’t need more. How about you take them into YOUR state instead? I am all for it, they can have California. Reading the comments here are enough to convince me that the overwhelming majority deal with demonizing Louis Farrakhan. Whatever faults he possesses however, the real subject of this article and therefore that under discussion is the separation of the U.S. into both a Black nation and a White nation. That being the case I am asking you here to look beyond the MAN and instead look at his CONCEPT. The fact that in our past not only enormous political preference has been applied but also an astronomical amount of our country’s treasure has been thrown at this problem, with the racial divide worsening and not getting better over the centuries. Who can honestly make the claim that racial harmony is improving? Whatever Farrakhan may or not be he is decidedly a realist and a visionary. Assuming he really has a plan and these are not just empty words we should give his plan the serious consideration it deserves. We do have states in the Union with strong breakaway movements (Vermont, California and more) with their existence accepted by all. The Farrakhan vision should at least receive the same consideration. My view is this: Some sort of plan must be enacted satisfying both races must be enacted. The alternative? A cataclysm of unknown proportions lies presently down the road before us. I do not like this alternative. OK. So which state(s) should we give to the blacks? Who’s going to pay to move them there, AND ALL the whites in those states out? Who’s going to supply power/water to those “black states” if they don”t have their own power plants etc? WIll they become their own “nation”, with their own taxes etc?? IF so, will they still be allowed to vote in the USA? Things like that need to get answered..
How about giving them all the blue cities, particularly the sanctuary cities. They can tax themselves to death supporting all the freeloaders. White folks will live in the suburbs and rural areas, take care of themselves and no longer support his nation, as in No More Money from Whitey. He’s just plain wrong. God just wants us to to live together peacefully. SUITS ME. INTEGRATION WAS NEVER GOING TO WORK IN THE FIRST PLACE. WITH MANY BLACKS, IT IS LIKE SHUFFLING A DECK OF CARDS WITH 2/3 FACING ONE WAY AND THE REMAINING 1/3 FACING THE OPPOSITE. I agree. Anyone that is so unhappy about being here should leave. I’m tired of them trying to tear our country down. Are they still welcome in Liberia? Nothing should be censored. Let the People determine what is hate speech and worth ignoring. The People need to know what is going on, and we can’t determine that unless we see, hear and read Everything! If this is what “God” desires, a one way ticket at our expense to Africa would fulfill his wish. His idea, not ours. Dang, do you think this Louis Farrakhan is a racist? What do you think would happen if a person not of color said the exact same thing? He already have a separate State, it is called Africa. If one of color doesn’t like the U.S.A. there is nothing stopping them from moving out. Hey! White is a color – ALL colors actually! This racism crap has got to stop! I was just about to type the same thing. Glad I am not to the only one who realizes white is a color too (well, technically it’s a reflection of all colors..)! I wish they’d all leave. Also obvious in his comment is that he wants to segregate blacks. And he calls us racists. Did he turn white by the way? Does he now wear a sheet and a dunce cap? They’d be decried as a white supremacist. It already exists – it’s called Liberia. For Africans, run by Africans. Calypso Louie can leave any time. I’ll help him pack. He can take all his followers with him. And the best thing about it. IS WE ALREADY PAID for it. So once they go, we don’t have to pay them anymore..
Can you imagine how much lower crime would be if they DID all up and leave? Amen Brother I couldn’t say better! I’m fairly certain that Liberia certainly doesn’t want a Socialist Muslim like Farrakhan in their nation. They’re one of the smart countries that have banned the hateful death cult. Maybe he should give Zimbabwe a try? I wonder what Mugabe thinks about a black- only nation? They don’t want him?? NEITHER DO WE! How about making a new country dead center of the Sahara Desert? Or dead center in Antartica! I agree Louis F may have his own country. Give him the liberal city-state of NYC and most of New England. They don’t want to be part of America anyway. They can be part of Louieland. No energy shipments to them, cut off the power lines at the border, same with any other national utility. Border crossings requiring visas. They eat what they can farm. Gee, starts to sound like what they claim they hate — WORK. Danny Noble, and build a Yuge wall around “their” state to keep them in. Yep, I agree. Fence NYC off with no gates to the outside. Also I think we could give them Los Angeles and San Francisco~~ as long they are fenced in. But why give up a piece of OUR country?? His god, alla leads him to say these things because alla does want to control, first part, and then the whole US. But as Scruffy-USN-Retired has stated. Get your one way ticket to Africa and then you have your own state. Only problem is, F’s god is a false god and not the God of the Bible. Notice F hasn’t left the US all these years. He’s as enamored with the wealth at those he references as “slaves”. The best way out of poverty is get a good education, get rid of the hate, learn to work cross-culturally as so many successful Blacks have done, be a hard worker, come with a good attitude. Stop blaming things on White people that are your own fault. And stop listening to rabid racists like Louis F.
As others have said, Africa has many nations that are majority Black and have majority or all Black government leaders. Louis, your dream awaits over there. Jamaica is nearby. Go for it. They already have their own state. It’s Liberia in Africa. Done under president Monroe. So any black people that can’t ****, ship them there. Okay. I think that is a great idea. Louis can go to whatever country he wishes to go to. And while he is at it he can take all the anti-White privileged people who are stupid enough to buy garbage to support all of the Black-privileged people who get paid ridiculous sums to play children’s games. Africa has a lot of countries that will let him in. I doubt too many people will be following him though because most people in the USA know where they will live life the best. This old fart is so nasty & offensive he makes skunks smell good. He is a lowlife race baiting attention ***** whose mouth is as deadly toxic as a Komodo dragon. Associating with him in any form or fashion should generate the same outrage, disgrace, disgust & revulsion as the KKK does. How sad that this poor excuse for a human now wants to separate black Americans from the rest of us. All blacks, no matter who they are, are American citizens. This man, however, wants to have is own nation in which he will be the ruler. He needs to return to Africa if he wants his own nation. Think he will get it done in Africa? This human being is a poor representation of the Lord. He would never do as the Lord Jesus did, give up his life for people! “all blacks no matter who the are, are american? ?” SO all those blacks living in say nigeria, or south africa are american?? Sorry but i do NOT THINK SO. Farrakhan should be deported with orders to shoot on sight if seen in America ever again. Outside of this nonsense, he is a traitor and gives aid adn comport to thos who want to see us dead. Every time this RACIST man opens his mouth to say something, it is ALWAYS RACIST, and usually very stupid ! The people that actually listen to him, and BELIEVE what this evil man is saying, are WEAK MINDED people, that are really racist, prejudiced people themselves. As far as his statement that God wants Black people to have their OWN State, that is BEYOND ridiculous ! And yet this dolt, gets PRAISED and loved by the morons in the media..
Farrakhan is an idiot! Don’t know why we listen to him. I don’t. He is just another dung flinger, like maxine stagnated waters , al brawley sharpton, don sour lemon, and cory booker. They already have a bunch of cities…Chicago for one…look at the shape it is in. May I suggest a state in Nigeria? There you will find true equality where you can compete with like ability personages. And may I buy you a one way ticket? Free speech is free speech and so if you do not like it, you do not have to listen to it, but if you cannot listen to what you do not like, what does that say of you? So basically you’re saying that he has the Free Speech right to spout his infinite nonsense, but we don’t have the Free Speech right to tell him he should just leave if he doesn’t like it here. I guess for you, Free Speech is Free Speech, until it isn’t. Come to think of it, He’s a “reverend” just like you. I see you like to disparage us but you have nothing bad to say about a proud anti-Semitic Muslim who has spent his life opposing truth, America, and God. But he’s fine right? It’s the rest of us who are the bad guys. Got it. DrG, was that to me or the Rev?? It’s a fine line between merely ‘free speech we don’t like’ and sedition, FYI. There is a state for them, it’s called Africa. Leave any time. 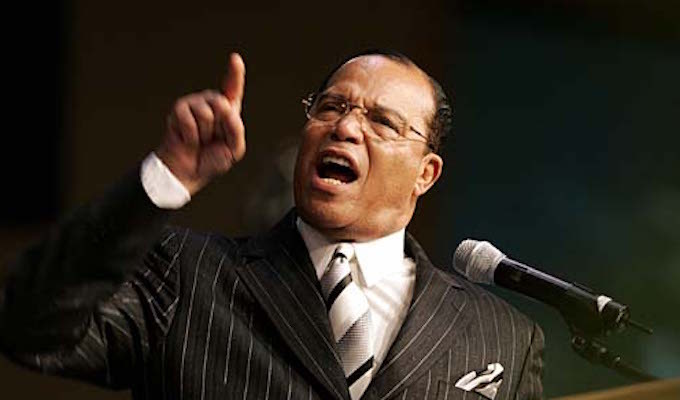 What is this Farrakhan gasbag lunatic blubbering about? There exists at least 60 Black ruled nation state disasters worldwide where he and his race identity politics bigots are free to relocate to tomorrow. There’s the door. -GET OUT! It’s past due that Farrakhan put his Black supremacist “principles” where his empty rhetoric has been for decades and set the example for Black prosperity, justice and peaceful co existence with “his people” on his 60+ nation state turf. –Don’t hold your breath America. Hustler Farrakhan knows a lucrative $$con job when he see’s it. Yup, I agree. Put everyone that would follow this jerk into one place and then eliminate the lot. Problem solved. No problem Mark…I think they would destroy each other! It’s a Deal, as long as you take your fellow Islamist’s with you!!! Can they be black on the outside and white on the inside? What about white on the outside and black on the inside? What percentage of white blood can they have and still be black? Can they be black if they are conservative and vote Republican? Can they be black one day and only say something and now not be black, like Kanye West? Being black is subjective, like being a man or a woman. This week I’m a poodle. I bet you expect everyone in the United States who isn’t a black racist to pay for it and make you “His Excellency President for Life, Field Marshal Calypso Louis Al Hadji Doctor Lord of All the Beasts of the Earth and Fishes of the Seas and Conqueror of the Galaxy,” right? Check your Black History Month calendar and you’ll see that it’s already been done. Pack your carpet bags and head on over to Liberia. Bon voyage! — 1974 response when asked for his impression of Africa, after he returned to the United States from Zaire, where he fought George Foreman.